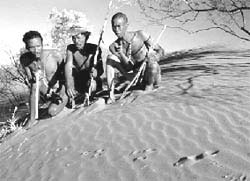 The government of Botswana is flouting international laws by refusing to recognise the rights of the indigenous San community over the resources of the Central Kalahari Game Reserve, alleges Survival, a uk -based organisation. "In one incident, 12 members of the community were tortured by government officials for six days for allegedly exceeding their hunting quota," said a spokesperson for Survival. Since the reserve has a huge tourism potential and is rich in resources especially diamonds, hunting quotas of the community have been reduced considerably and they have been urged to settle outside potential mining areas. Survival has recently launched a vigil outside the Botswana High Commission in London to make the European tourists aware about the situation.